Some sales leads are just tire kickers looking for a deal. Others are ready to buy and they’re looking to make a decision as quickly as possible. Once you’ve started to build a reliable sales pipeline, your focus shifts from getting leads to identifying, nurturing, and closing those leads--making sales. How do you know if someone is a good sales lead or not? Which leads are the most likely to buy? When’s the right time for you to reach out to a lead and when should you nurture them with more information? This is the purpose of creating a lead scoring model. It gives you an automated, scientific way to rate, rank, and prioritize sales leads in order to improve the efficiency and effectiveness of your sales operations. Rather than treating each sales lead equally and chasing down every email address that comes through the door, you can key in on those who the best fit and most likely to buy. This means you’ll be able to close more deals and grow your company more quickly. Do you need a lead scoring model? The truth is that not every business needs to implement a robust lead scoring model. Lead scoring is about improving the sales process, prioritizing leads, and closing more sales. But it’s only necessary if your company has a mechanism that will use the lead score. In most cases, that means that you have a sales team that’s receiving more leads than they can follow up with and they need a way to prioritize their time to maximize sales. But lead scoring can also be an effective mechanism for automated nurturing as well, serving as a benchmark to trigger key messages or nurturing campaigns. Does your team have more sales leads than it can follow up with? Are your “leads” often not qualified or not a fit when contacting them? Could your sales process be made more efficient and effective? Do you have specific sales/marketing content that should be delivered to leads at key points in their buying journey? If these are true, then you’re probably ready for a lead scoring model to help you create a system that works. An effective lead scoring model will give you and your team a way to immediately identify the leads that warrant the most attention. Most models are based on a scale of 0 to 100, with a score of 100 being the most qualified lead in your pipeline--best fit and most engaged with your company. As you learn more about each lead or they engage in further activity through your website, marketing, or sales channels, their score should increase. In an ideal world, there would be certain thresholds throughout the process that indicate a lead is ready for a next step in the buying process or funnel and it would trigger some kind of further nurturing or outreach. It will take some time to create a sophisticated and accurate lead scoring model, but you can start with the basics and then learn how to test and improve your system. Sarah Mason is the marketing director at a tech startup, she’s been checking out your company’s website. She starts with a score of 0--you know nothing about her or how engaged she is with your website. Sarah visits your site and downloads a white paper and becomes a lead. In doing so, she fills out a form that tells you more about her and her company. Now, she has a lead score of 25. Since she’s now on your email list, you send her your weekly newsletter and she clicks on a link to visit your website. While there, she browses the site in more detail. This updates her lead score in your CRM. Sarah now has a lead score of 55--she’s over halfway to the max score of 100. At this point, you may want to automatically trigger a special offer for leads that have reached a score of more than 50. In this case, maybe you invite her to check out a webinar recording about your company. She receives the email and clicks the link for the webinar--she must be really interested in your services. At this point, it probably makes sense for your sales team to reach out. Sarah has been qualified as a good fit for your company and she has demonstrated a lot of interest in learning more about what you have to offer. Since she reached a lead score of 75, your sales rep gets an alert and reaches out about setting up a call. On the call, your sales rep can get a better understanding of her needs and further qualify her, inputting more information into the CRM. If the deal closes, that’s great. If not, then she remains in the system with a high lead score and your reps know that she’s close to making a buying decision. The most valuable aspect of creating an effective lead scoring model is identifying those who are ready and most likely to buy and then contacting them at the right time to win their business. This gives you a way to identify those opportunities at a glance and close more deals. In theory, lead scoring makes sense. You want to assign a grade to the people who are ready to buy and give others more time to show interest. 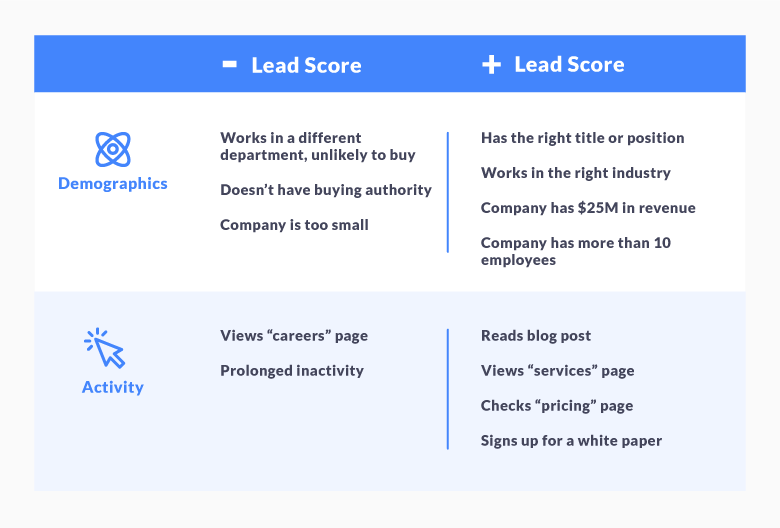 But, when you get down to the specifics, it can be difficult to define exactly how to structure your lead scoring model works, which factors to consider, and how much weight to give each one. The truth is there’s no “right” answer. Each company is different and their prospective buyers will take different actions and have different attributes that make them stand out as qualified leads. Each component represents a different aspect of the lead that you’ll want to evaluate to determine their score. By breaking these characteristics down, you’ll be able to define and pinpoint which things are most important to your model and which ones are not. The simplest way to qualify a lead is based on their demographics. Each of these factors can be used as a way to understand the lead, how qualified they are to purchase, and/or which product or service they may be interested in. In most cases, you should have a keen idea of what your target market looks like and which companies and people would be a good fit for your product or service. As your company grows, you can get more sophisticated and do a demographic analysis of your current customers in order to identify trends and patterns that indicate a lead may be more likely to become a customer. Leads should also be scored based on their level of activity and engagement with your company. 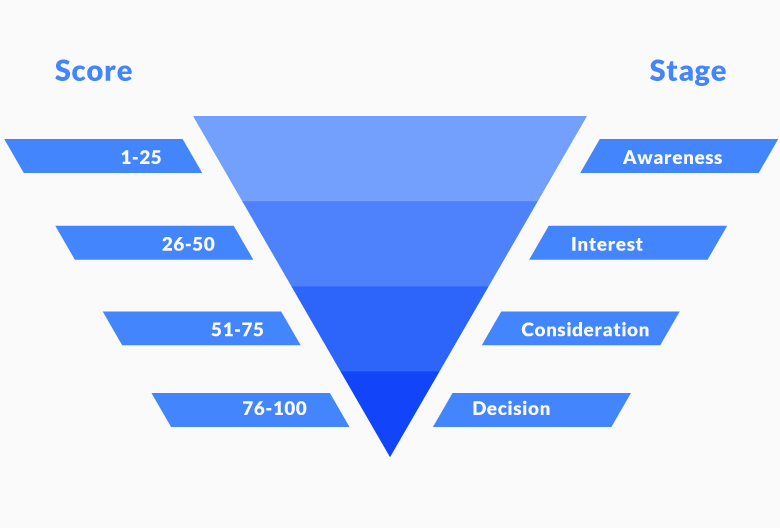 You want to identify the people who are most engaged and most likely to purchase so that you can focus your resources on those deals rather those who have entered your funnel but have no intent or reason to actually buy. Each of these activities can indicate that the lead is researching your company and considering a purchase. In addition, some actions (like viewing a “careers” page or a long period of inactivity) may lower the lead’s score as it becomes less likely they’re truly interested. Sometimes, these attributes are represented as a Grade and a Score. These represent the same thing as Demographics (grade) and Activity (score). It’s essential to have both components to create an accurate lead score. Otherwise, you can end up with false positives and end up wasting time and energy chasing down “leads” that perhaps never were in the first place. The classic example of this scenario is when a lead is scored based only on activity, a job applicant may get flagged as a hot lead because they’ve spent tons of time on the website or actively engaged with email marketing. Having demographic information--or grade--will allow you to identify if the person is not a good fit and score them appropriately. On the flip side, having a lead that fits a specific profile is not enough to prioritize the people who are most engaged and most likely to buy. You also need to see how engaged they are with your company and if they are taking key actions that indicate their interest. Save yourself time and energy by using both factors to score and qualify your leads. Then you can quickly and easily identify the ones that are closest to converting into customers. Now that we’ve covered the basics of how lead scoring models work, the specifics of the model is largely dependent on your company and which types of demographics and activities are most important to qualifying a lead. After that, assign a value to each element of your lead scoring model. Some demographics and activities may earn the lead a big boost in lead score (e.g., they are a high-revenue business, they visit the pricing page, etc). Others may be more subtle--like clicking on a blog post, which indicates some interest but may not be a strong signal that they are likely to buy any time soon. For most activities, it makes sense to assign a value of somewhere between 5 and 20 points on a 100-point scale. Then, set benchmarks as to what scores correspond to different stages in the buying cycle. This will give you a way to qualify and segment your leads based on a traditional sales funnel. 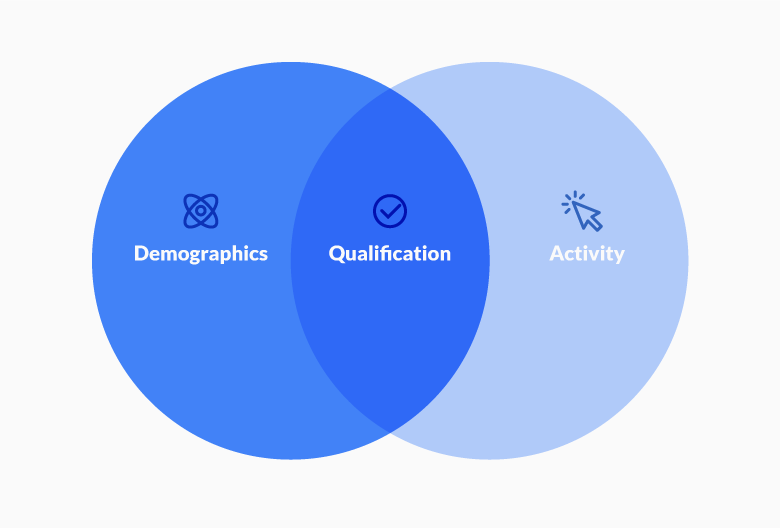 Run through a few test scenarios with imaginary leads to see if a certain combination of demographics and activity would place them in the buying stage that you would expect. You may determine that you need to increase or decrease the values you’ve assigned to each attribute or that certain ones are too heavily weighted and skew the results. Remember that this is an iterative process. Even once you find something that seems to work well, you’ll want to keep refining and tweaking it to improve the results. Last, but not least, you should test your scoring model against real-world scenarios. You can do this by either analyzing past leads and assigning them a score based on your model and then look to see if their score aligns with expected buying behavior. Or, try implementing the model for a few weeks or months and monitor the results. Doing a live test of the model will give you the best results because you’ll have a chance to identify false positives (leads with a high score who do not or will not convert) as well as look for cases where leads do convert despite having a lower score than expected. No lead scoring model is perfect--and it certainly won’t be on the first attempt. Build in time for testing, tweak your model, and continue to improve. 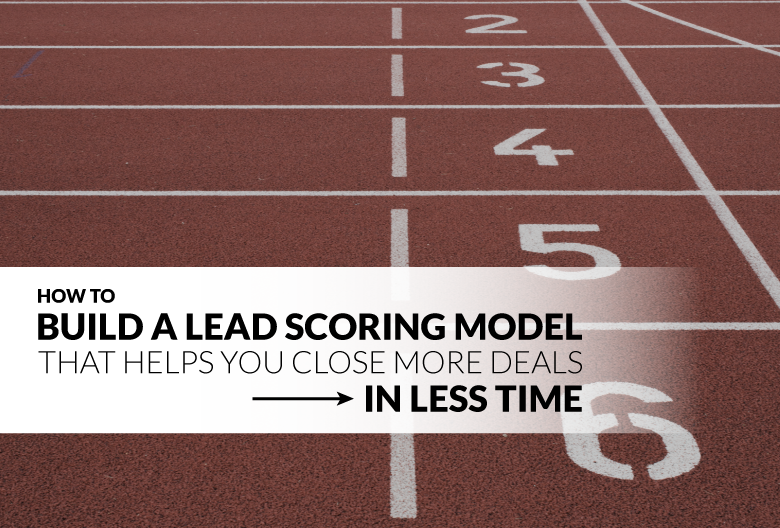 Over time, you’ll dial in the scoring model to give you more insight into each lead and help you close more deals.